Shuna Hammocks is able to diagnose, treat and resolve most hair and scalp problems, making you look and feel great too. It’s hard to feel good if you’re suffering from hair or scalp problems, but fear not! Here in Sussex, we are lucky to have one of the country’s leading trichologists, Shuna Hammocks, to treat and resolve any hair problems. Shuna treats all hair problems, including genetic thinning, hair loss and hair breakage, along with scalp conditions, such as eczema and psoriasis, for both male and female patients of all ages. 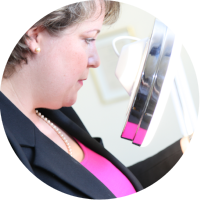 After a comprehensive consultation, exploring a patient’s medical history, diet, lifestyle, medication and any relevant genetic factors, Shuna examines the hair and scalp and is usually able to make a diagnosis immediately. A treatment programme is then put into place. Follow up visits and support via telephone and email, is equally important. Where hair breakage or reaction to hair colour is a problem, Shuna will also work alongside a patient’s hairdresser to resolve the issue. “It’s lovely to see the relief on people’s faces when they realise that we not only understand how they feel but can do something to help,” says trichotherapist, Kelly McMahon, who works alongside Shuna. Shuna is the only qualified and experienced trichologist working in Sussex and despairs at the empty promises of so-called ‘miracle cures’ and pseudo-clinics that promote hope, but deliver more disappointment and distress. 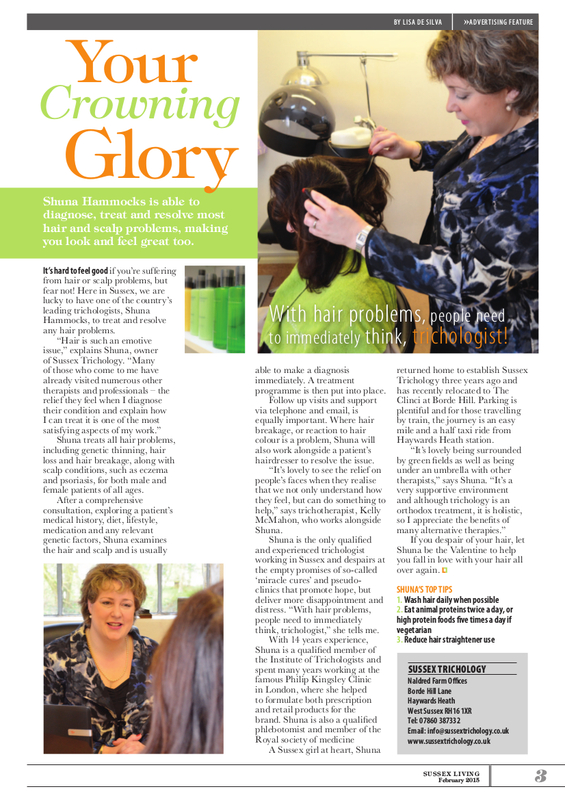 “With hair problems, people need to immediately think, trichologist,” she tells me. With 14 years experience, Shuna is a qualified member of the Institute of Trichologists and spent many years working at the famous Philip Kingsley Clinic in London, where she helped to formulate both prescription and retail products for the brand. Shuna is also a qualified phlebotomist and member of the Royal Society of Medicine. A Sussex girl at heart, Shuna returned home to establish Sussex Trichology three years ago and has recently relocated to The Clinic at Borde Hill. Parking is plentiful and for those travelling by train, the journey is an easy mile and a half taxi ride from Haywards Heath station. If you despair of your hair, let Shuna be the Valentine to help you fall in love with your hair all over again.